The Internet in Cuba: Google has made Chrome available for download in Cuba – what has changed? 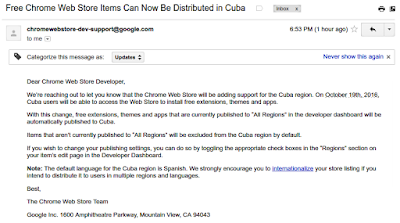 Google has made Chrome available for download in Cuba – what has changed? Google announced yesterday that folks with Cuban IP addresses can now surf to www.google.com.cu and download a copy of the Chrome browser. That is a small bit of good news, but, what has changed? While Google could not legally "export" Chrome to Cuba before yesterday, Cubans who want US software have always been able to get it. During an early trip to Cuba, I visited a government storefront in Havana where you could get copies of the latest software releases -- as long as you brought your own floppy disks and, if you wanted a manual, printer paper. Today software circulates on (non-government) flash drives. I don't think this announcement changes anything for the few Cuban users with Internet access. committed to full compliance with U.S. export controls and sanctions programs and, as a condition of our export licenses from the Treasury Department, we will continue to block IP addresses associated with the Iranian government. In 2012, they made Chrome extensions available for download in Iran and in 2013 the Google Earth plug-in became available. In a terse post on the Google policy blog, Pedro Less Andrade, Director of Government Affairs & Public Policy, Latin America, says "we’ve been working to figure out how to make more tools available in sanctioned countries" and I believe him. I see no reason to believe the Cuban government would have objected to users having Chrome instead of another browser, so that leaves US policy -- has US policy changed? 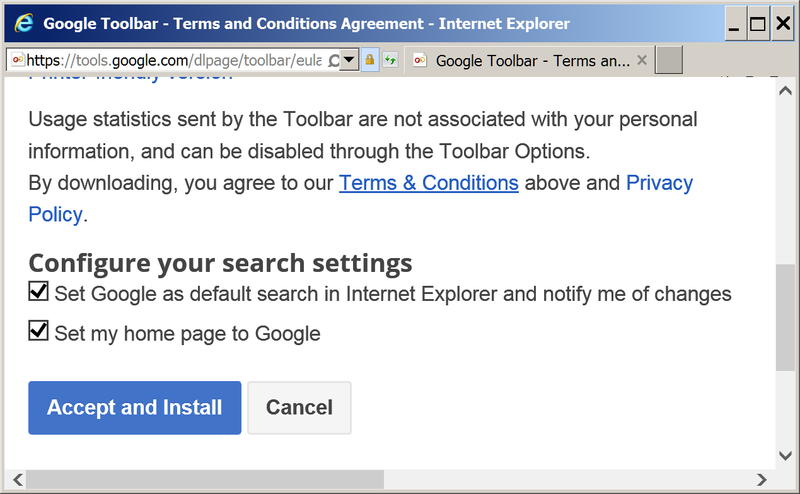 It has obviously changed at least a little bit -- Google would not offer Chrome without a license. If they are taking the piecemeal approach they used in Iran, this is a trivial announcement, but this might signal a more significant shift. Google's announcement refers to "evolving" trade restrictions -- has the "evolution" sped up? Could this announcement be related to the trip Eric Schmidt made to Cuba last month? Schmidt was accompanied by Jared Cohen, Google's Director of Ideas, who, before joining Google, was a member of the Secretary of State's Policy Planning Staff and served as an advisor to Condoleezza Rice and later Hillary Clinton. Google has Washington insiders like Cohen and Schmidt as well as lobbyists, and I'd like to think that making Chrome available is just the start of a major shift in Washington policy -- encouraging any export or service that enhances Cuban communication and connectivity and indemnifying US companies against any claims the Cuban government may have against them. One can even imagine Google or US Satellite Internet companies providing connectivity to Cubans. The Castros might not be too crazy about that idea, but I can dream. Being able to download Chrome will have no impact on Cuban users, and I do not think either Google or the Castro government had to change policies to allow it. If anything has changed, it is the policy of the US Government -- let's hope this was the tip of the iceberg. 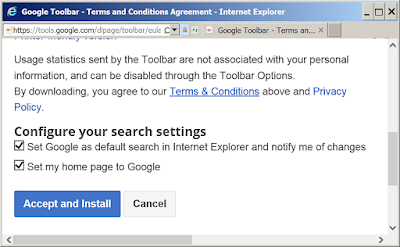 Google is now allowing Cubans to use their Internet Explorer Toolbar. This is a minor step since Cuban's could already use Google's Chrome browser, which provides much of the same capability as the Toolbar. I suspect its main impact will be to give Cuban Internet Explorer users a chance to switch from Bing/Yahoo to the Google search engine. When you install the Toolbar, the default is to switch search from Bing/Yahoo to Google. That being said, the move raises intersting questions like: What precipitated the offering – debate within Google or a US government policy change? Does this foreshadow opening of development tools and services, which would be a more important easing? The pros and cons of and roadblocks to the offering would make a much more interesting story than the availability of the Google Toolbar itself. While this is a step in the right direction, it does not seem significant. I don't know how many Chrome users there are in Cuba, but I can't imagine many of them bothering to use bandwidth to download apps from Google. (Is there a lot of "Chromeware" in El Paquete)? 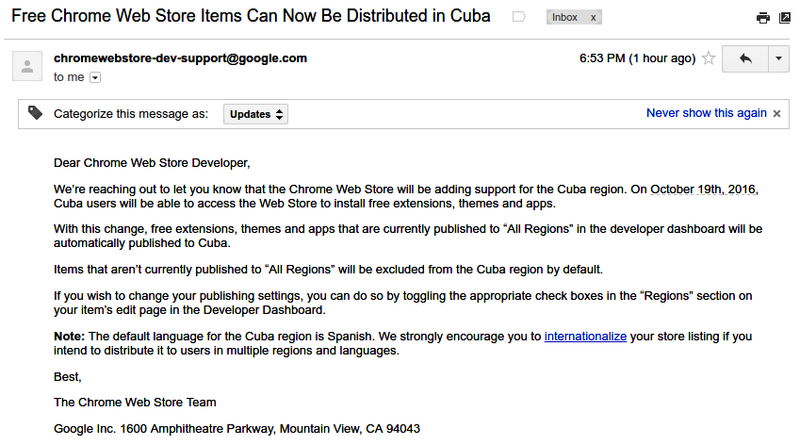 I wonder why Google takes this small step, while continuing to block Cuban access to Google Cloud Platform sites.